Our exhibition at the Beautiful Arnheim Gallery, Massachusetts College of Art and Design opened October 10. Recent work from Namungona Children's workshops, and Mulago hospital Art Therapy Sessions as well as work by all Consortium members was on display. About 10 pieces were sold opening night. And the exhibition runs to October 26, so more sales are expected. Many people helped us in organizing and mounting the show including Pete Meyer, Kathryn Kirschner, Joe Jackson, Veronique-Anne Epiter, Jacqueline L. McRath and Susan G. Thompson. 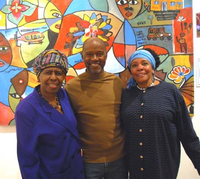 In the photo, Jacqueline L. McRath, Ron Bayless and Susan G. Thompson.